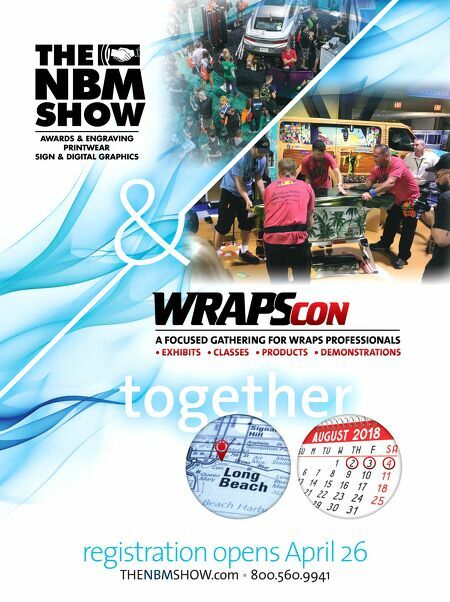 58 • March 2018 • S I G N & D I G I T A L G R A P H I C S WRAPS DIGITAL GRAPHICS Fleet Efficiency Time-saving tips for fleet graphics providers Charity Jackson is co-owner of Visual Horizons Custom Signs based in Modesto, California. She has been in business since 1995, and has worked in the sign industry for over 25 years. You can visit her website at www.vhsigns.com. B Y C H A R I T Y J A C K S O N Let's Talk Shop months or years. This is part of the bid process and assures the customer that they will receive consistent pricing. We may also make considerations for multiple vehicles at a time versus one vehicle. Any pricing and dates are noted in their file. Design During the design phase of the job, especially on the initial order, we try to plan the graphics in such a way as to speed the installation. This preplanning makes a big difference on how quickly the graphics can be installed, and creates consistency across multiple vehicles. One of our solar company clients has a variety of vehicle types in its fleet. They wanted a consistent look on all the vehi- cles so we incorporate the same blue swish design on all the vehicle types. The sizing and placement varies by vehicle type, but there is still a consistent overall look. The next step, with these swishes and other graphics we design, is to plan for these graphics to land on the vehicles in smart ways. This means we'll keep in mind obstacles when planning where the graphics will finish or overlap. This is espe- cially important with text and fine details. By shifting these in the computer ahead of time the installation will go smoother and faster. When setting up print files we also try to print in large verti- cal or horizontal panels depending on which option will give us the best results with the most efficiency. If we want a seam- less wrap we set up our panels ahead of time, with overlaps, so S aving time on fleet wraps and graphics often starts well before the vehicle(s) come in. There are many ways to save time during the installation, but smart setup and record keeping save time and money from the start. Ordering When we handle a fleet of vehicles for a customer, it's usu- ally an ongoing account. We may install a few vehicles at a time, but they often come in waves spanning months or years. Any customer that has ordered from us multiple times gets their own folder. We of course file these alphabetically with the rest of our accounts, but the individual files stand out and contain all the paperwork and notes for that particular customer. When a fleet customer calls or emails to place an order for another vehicle we can easily pull their file and have all the reorder information quickly. These files will contain previous invoices and pricing, artwork print outs, color notations and anything else we'll need to quickly process the new order. When we initially quote a new fleet project we typically determine set pricing for each vehicle type for X number of Designated and organized folders speed the reordering process for fleet accounts. 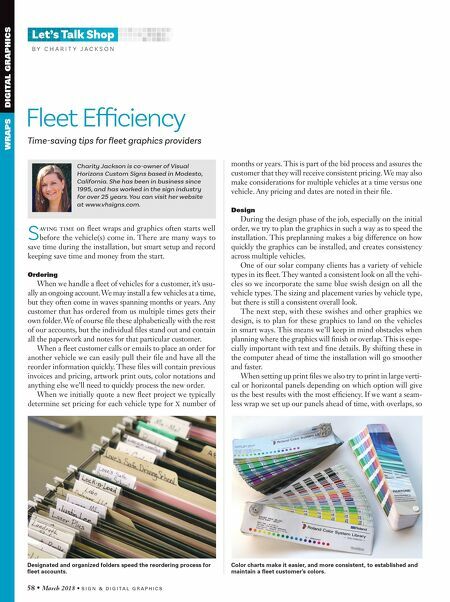 Color charts make it easier, and more consistent, to established and maintain a fleet customer's colors.